This condo is located right on the mountain at Copper Mountain Ski Resort. It is one block from Center Village. This ski-in unit is nestled within a beautiful forested mountain. It is situated between the C-Lift and the American Eagle Lift. The ski trails will allow you to ski down to your front door. This is a ground floor end unit and has a lower level ground floor parking garage. The outdoor hot tub is right outside the door. Enjoy High Speed wireless internet and high definition cable television. Sleeping Arrangements: The bedroom has a King size bed, walk-in closet and wall mounted HDTVs. There is a new queen leather sofa-sleeper with foam mattress, (see pictures) right in front of the fireplace, unbelievably comfortable. This unit sleeps a maximum of four. 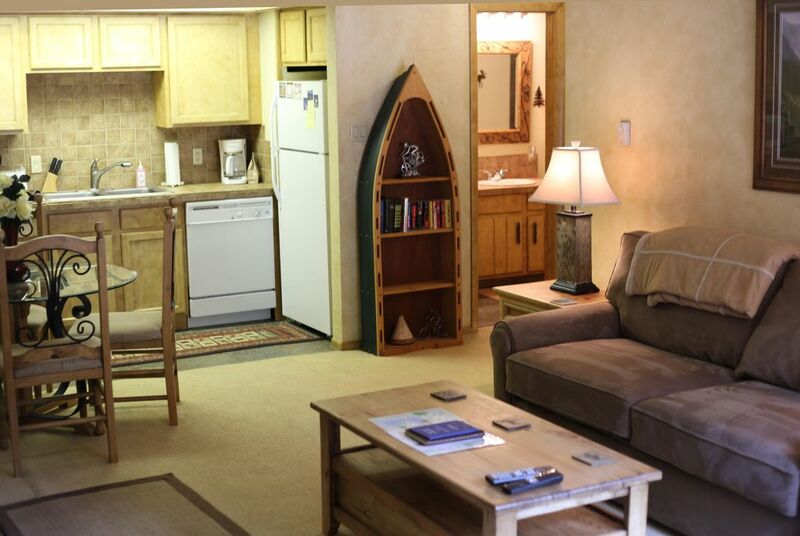 Floor Plan: This unit has been remodeled, refurnished and tastefully redecorated in a warm mountain theme. In the family room there is a flat screen HDTV/DVD and a gas fireplace. Just off the family room is the full kitchen with microwave, dishes, pots/pans, baking dishes and utensils. This condo has a full bath. There is also a private ski locker next to the front door. A laundry room is available in the complex. This condo is 604 square feet. At Copper Mountain there is so much to do: Skiing and snowboarding, snow tubing, fabulous hiking, mountain biking, and great restaurants and bars. Copper Mountain Ski Resort host numerous amazing music festivals. Copper is known as the epicenter of Colorado road biking with a paved bike path that goes from Breckinridge to Vail. Why would you choose this condo? Didn't you come to the mountains to enjoy nature, peace and tranquility? Forgo those hotel hallways and city elevators and enjoy a real mountain atmosphere. Property was exactly what we needed. Great ski access. Close to everything. Very clean. Very easy to communicate with. Easy parking. Every needed amenity with no unnecessary fluff. Comfortable, cozy, and great base camp. Very clean, beds super comfortable and the location made it easy access to everything necessary for a successful ski holiday. We enjoyed our stay and loved the location. It’s near the garage and hot tub. We were able to ski from the mountain to the room which was even more convenient.